Climate change is caused by the emission of greenhouse gas (GHG) into the atmosphere by human activities. Any organization that wishes to effectively reduce its contribution to climate change must first know how much GHG it emits, and which activities it comes from. Organizations find out by conducting a GHG inventory. The Inventory of Missouri’s Estimated Greenhouse Gas Emissions in 1990 was published by the Department of Natural Resources in 1996. According to the inventory, in 1990 Missouri emitted 148,071,000 short tons of carbon dioxide equivalent of greenhouse gas. Burning fossil fuels for energy accounted for about 75% of total GHG emissions. Generating electricity creates more GHG than any other use in the state. Electricity is not really an end use, however. Electricity itself is used as an energy source for other end uses. Distributing electricity to its end uses shows that transportation accounts for the most GHG emissions, followed by residential structures. This graph shows the amounts of GHG with electricity counted as an end use, and also with electricity distributed to its various end uses. Amounts are in short tons of carbon dioxide equivalent. Short tons are standard U.S. tons (2,000 lb.) More recent practice is to use metric tons (2,204 lb.). Carbon dioxide equivalent is slightly more complicated. Because gases vary in their power to trap heat in the earth’s atmosphere, scientists need a way to compare the effects of different GHGs. Carbon dioxide is the greenhouse gas of most concern, therefore, scientists measure how much heat trapping effect a given amount of a given gas has, and then convert it to how many tons of carbon dioxide would be required to have the same effect. In 1990 Missouri emitted many different kinds of GHGs: carbon dioxide, methane, nitrous oxide, refrigerants, and fire suppressants. The headline number above means that taken together, their heat trapping effect was equivalent to 148,071 short tons of carbon dioxide. The greenhouse gas inventory report is not available online. You can find it at the St. Louis Public Library and at several university libraries around the state. An update completed in 1999, however, reviews the major findings of the inventory and discusses future trends as they were understood back then. The update is available at the Missouri DNR website. 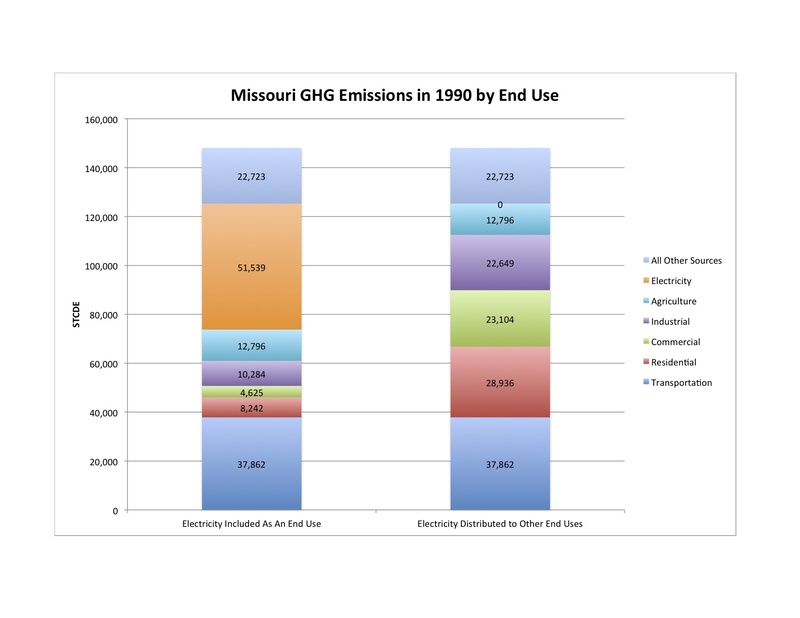 In future posts, I will look at Missouri emissions from electricity, Missouri emissions compared to those of other states, and at an update to the inventory published in 1999. By mogreenstats in Climate Change on 2013/01/09 .